We came home from forgiveness vespers Sunday afternoon - ready (in theory) to begin Great Lent. I had been shopping at Costco, purchased my weight in hummus, and felt almost "prepared" for the 40 days without meat and dairy. (Mise en place as Martha Condra explains on this weeks WHEAT WINE AND OIL. Forgiveness Vespers is both my favorite and least favorite service. For those who haven't experienced it, it's a beautiful but rather chaotic service that ends with each of us asking forgiveness of EVERY other parishioner. It's kind of embarrassing and sometimes you bump heads (because there's bowing and kissing of cheeks). You invade one another's space and smell their breath - and it nearly paralyzes my daughter Isabelle with fear (she's not a hugger), while two year old Jane can't get enough. "Forgive me, dada" she repeated all afternoon - in a regal Audrey Hepburn sort of voice. So I came home, ate approximately 25 milk chocolate candies and fell asleep. Not the "mmm really needed that rest" kind of nap, but a "block out the hideous mess around me" type. When I awoke, I felt worse. There's something so utterly humbling about apologizing to so many people - it forces you to look a little deeper. There's something about looking your husband, your children in the eyes and publicly asking for their forgiveness that causes you to forget the petty grudges you've held and realize how you may have injured them. In short, I came home and saw things more clearly. Not to "confess" here on the blog - but I did realize that I have really fallen short particularly in the homemaking department. I mean I bake bread and do fun domestic things - but the daily tasks (the unseen ones that require patience and discipline and servant hood - like laundry) are really sub par. I mean I can't even tell you about my library fines. There's a lack of structure and order in my home that is inefficient if not destructive. But as I picked myself up after that nap, I thought of Jonah - first running away from God and then returning. I thought of how Fr. Bill told us today to forgive one another but also to forgive ourselves - because there's work to be done. For some Christians, it seems the temptation is to get lost in details of the fast - almost obsessively checking labels for hidden dairy - and forgetting that the Resurrection is always close by. I have the opposite problem. From my Calvinist and rebellious roots, I remember the Resurrection, but struggle with the discipline and patience needed to participate in this beautiful season. I'm quick to cut corners, make exceptions, and excuse myself from obligation - justifying my behavior - I mean I wouldn't want to be a Pharisee! What I'm starting to realize, however, is that the more excuses I make, the more I miss out. Or in other words, the more I participate - give myself over to the rules and details, the more I gain! I gain not from pride at my own minuscule successes, but because my own arrogance and "logic" is put aside. Last week, the girls and I started a garden. Ha Ha - it's 20 degrees outside - what we started looks nothing like a garden. 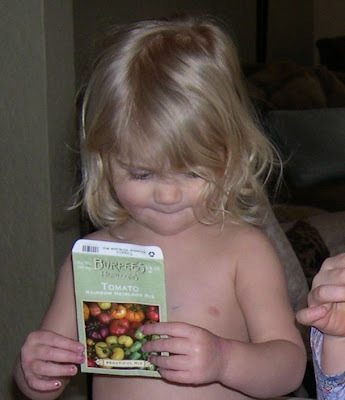 Tiny little seeds were placed in a smidgen of dirt in egg cartons. These little guys require a lot of work - I mean they are constantly drying out and they need the light of my sun porch, without the freezing temperatures. But now I am starting to see why my past gardening attempts have failed. See, I want THIS (my garden blogging expert) without all the fuss. But do I? Just as in my spiritual life, I'm starting to realize that my peace and satisfaction directly correlate with the style and amount of work I put in. Maybe that's why my mother-in-law irons her sheets or my mom separates her laundry so completely (I mean she has off-white loads - whatever Martha). I know there is balance here - I know from my therapist days that there are those who struggle with perfectionism and OCD. At this point in my life, however, I am not one of those people. 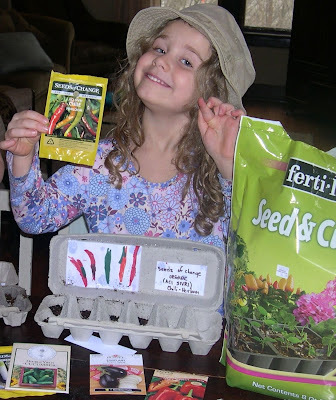 So, we at the Maddex home are going to garden - planting tiny seeds in pots indoors (Some of us like to wear hats when we garden and some of us prefer to garden in the buff). We are also going to (God help us) turn off the t.v., say our prayers, attend Church (on time) and participate in the fast. We are going to do this because we believe in home grown, organic vegetables. We "...look for the Resurrection and the life of the world to come...." But we also do this because we believe that how we live now has meaning and importance. That we can experience God and His peace today - as the sun shines through the windows of my porch and the hymns of St. Andrews Canon are sung. Great, great, great post. Your grumpy, dirty house inhabiting,quick tempered, Lentish feeling sister-in-law really needed that today. So lovely. A blessed Lent. As always, you are all in our prayers. And besides "Elijah," Russell likes to say "Bobby." Thanks for the post, Paige. It was much needed. This is a wonderful, refreshing read. Somehow planting seeds in egg cartons in 20 degree weather seems like the perfect way to start lent, because we start small, with hope, even against impossible odds. I also love that you went home and ate 25 chocolates and fell asleep. That is the kind of detail that makes me feel so very at home with you. Thank you--this was exactly what I needed to read tonight. Terrific post! I, too, entered Lent grumpy. Wow! This was what I needed to read remembering that we are never-ever alone.